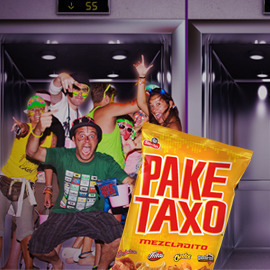 Paketaxo: your perfect party snacks! Going to parties is an important thing in the lives of every teen and young adult from 15 to 24. When life gives them lemons, they make margaritas and party. It may start as an informal small gathering but always ends up in a party. All they need is music, snacks, alcohol, a lot of friends, some spontaneity and some triggers that dare them to do something forbidden and they are ready to create memorable moments. Paketaxo wants to help people to have even better times at parties and make connections with others easily by offering them a new kind of snack. Ready for the challenge? WOW us with new product ideas full of fun for Paketaxo!